The Health Science Alliance (HSA) Biobank has over 5,000 biospecimens from more than 2,500 participants. Consenting participants are predominantly patients undergoing surgery or other procedures from the Prince of Wales (POW) Hospital, POW Private or Royal Hospital for Women at Randwick. Collection has also recently commenced at St. George Hospital (General and Private) and Border Medical Oncology located in rural NSW. The HSA Biobank tissue continues to be collected from a variety of body sites, and represent non-malignant and malignant conditions, as well as common and rare cancers. Tissue is stored as formalin-fixed paraffin (FFPE) embedded blocks or fresh frozen tissue. Blood is collected (usually) prior to surgery and stored as white blood cells and plasma. Many participants also consent to collection of their health data including pathology reports and Medicare Australia data. Please let us know if you would like clinical data to accompany biospecimens for your research project. 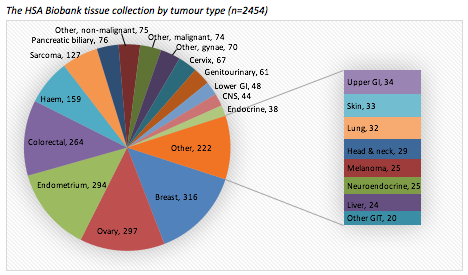 The chart below shows the range of clinical diagnoses of consented participants, grouped into broad categories, in the HSA Biobank (current as of June 2017). All our specimen data is stored in a secure, web-accessible database, Open Specimen. You are able to search the specimen catalog in Open Specimen for specimens of interest for your research project. Please contact Nicki Meagher, Biobank Project Manager, if you have any queries, or would like to discuss how the HSA Biobank can assist you in your research.